1Department of Materials Science and Engineering O.A.U., Ile-Ife, Nigeria. 2* Mechanical Engineering Department, University of Ibadan. tests were performed on the specimens. 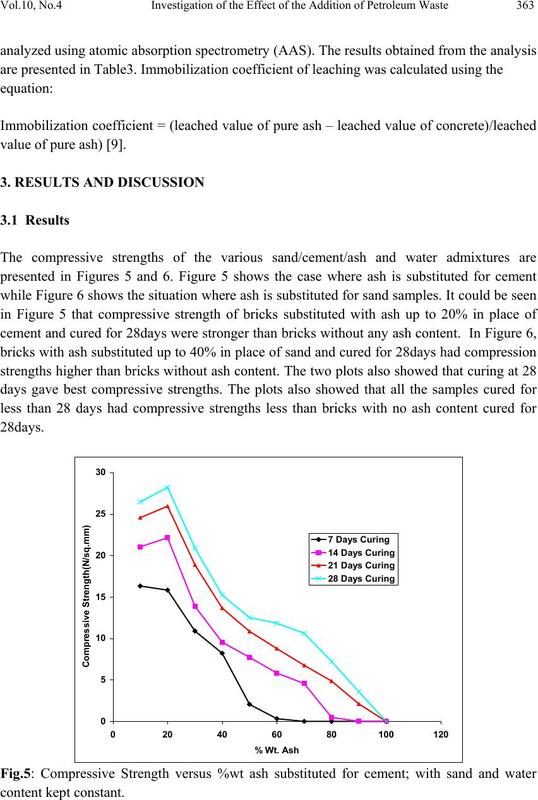 compressive strength than the control mix (0% incinerator ash) after 28 days curing. concrete, cement mixed with water served as the glue which holds strong aggregates tog ether . using up to 10 percent less water . pozzolanic reaction with lime from cement hydration. time. Strength is only a measure of the ability to sustain loads at a given point in time . resulting in loss of strength and durability . 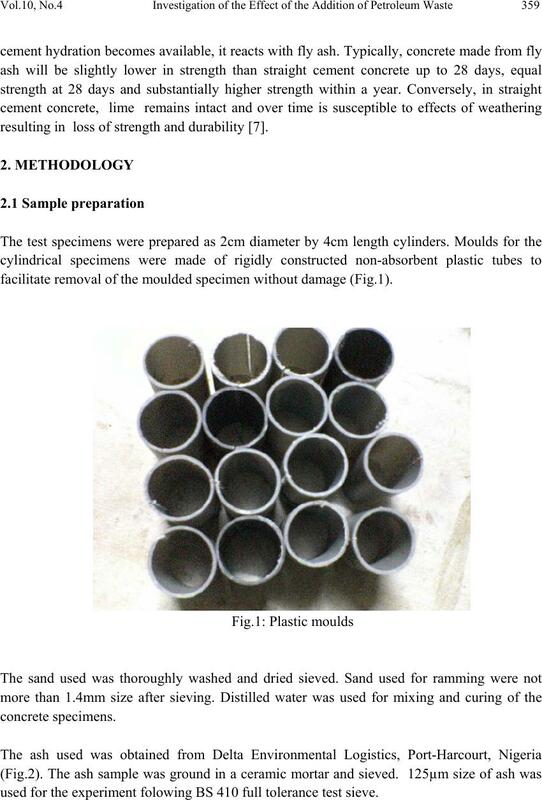 facilitate removal of the moulded specimen without damage (Fig.1). used for the experiment folowing BS 410 full tolerance test sieve. with with ash additive to the same tone of reduction (Table 1). 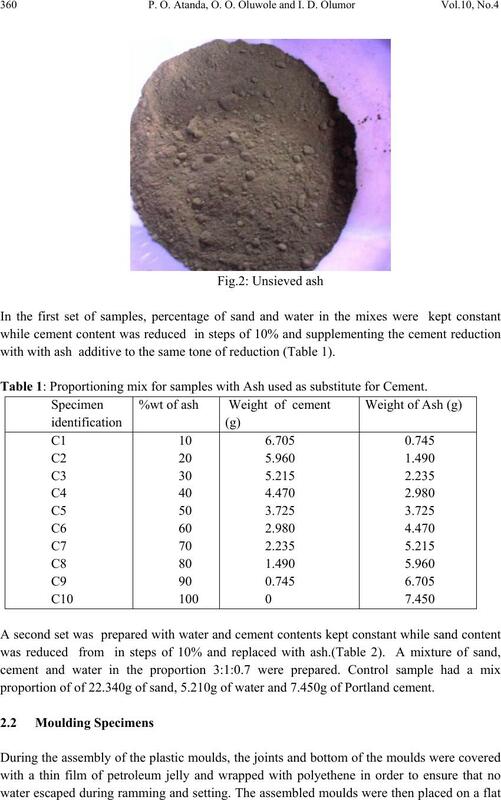 Table 1: Proportioning mix for samples with Ash used as substitute for Cement. proportion of of 22.340g of sand, 5.210g of water and 7.450g of Portland cement. mould cavity and then subsequently compacted and rammed for about 2 minutes. Table 2: Proportioning mix for samples with Ash used as substitute for Sand. load was noted and recorded. 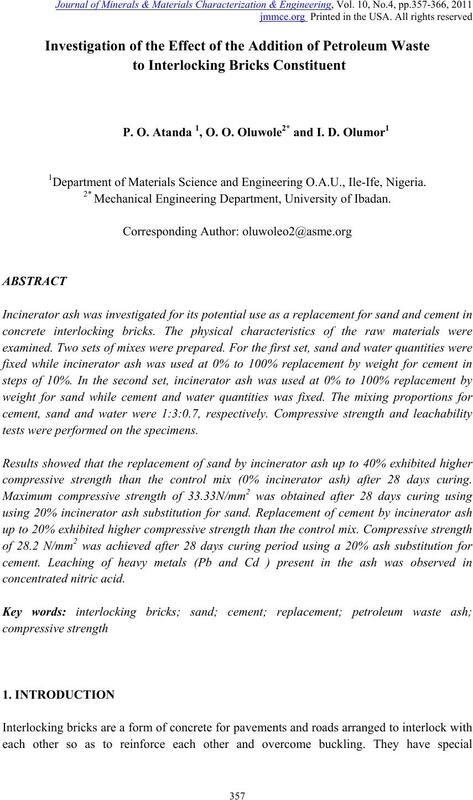 general use concrete is about 21 N/mm2 . beakers. The acid solution was then poured into the beakers and agitated for an hour. value of pure ash) . bricks. 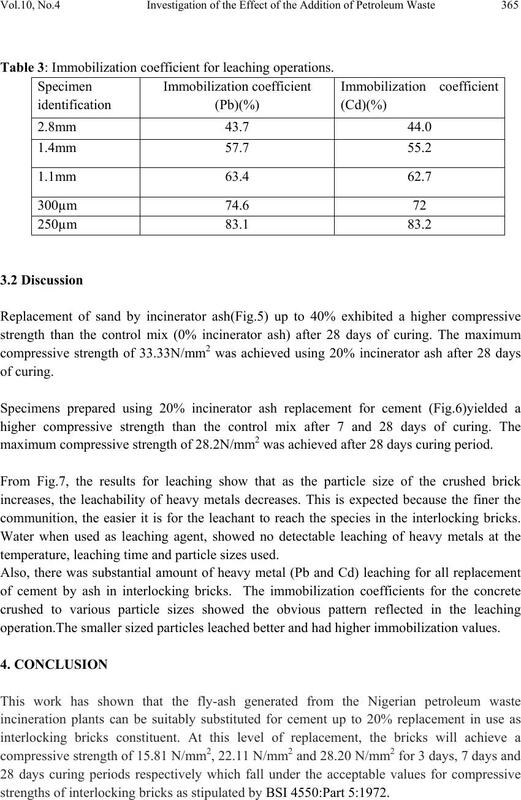 The result showed that leaching increased with decreasing particle size of bricks. metals present in the ash incorporated in the bricks. Table 3: Immobilization coefficient for leaching operations. 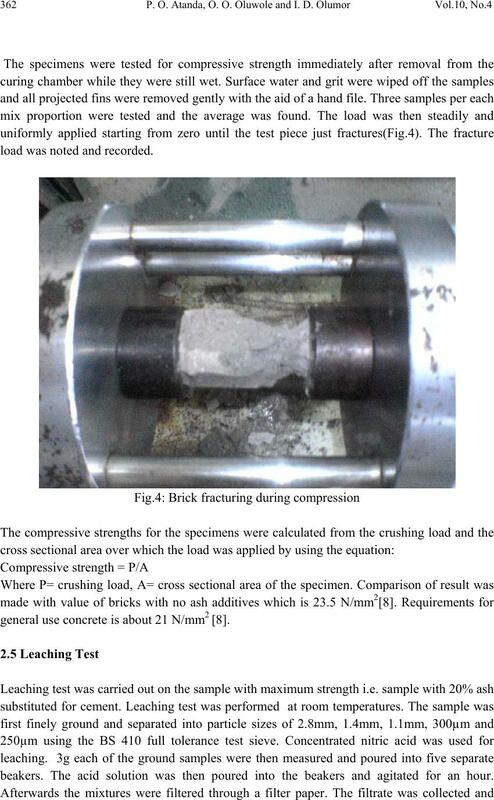 maximum compressive strength of 28.2N/mm2 was achieved after 28 days curing period. communition, the easier it is for the leachant to reach the species in the interlocking bricks. 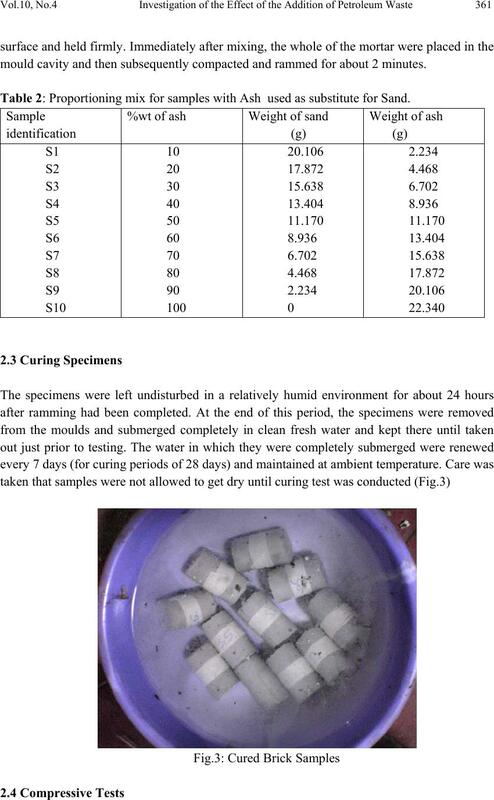 temperature, leaching time and particle sizes used. operation.The smaller sized particles leached better and had higher immobilization values. 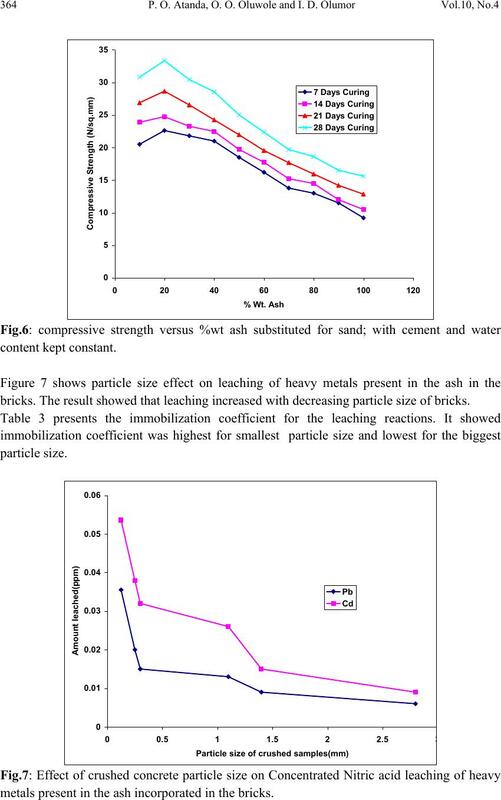 strengths of interlocking bricks as stipulated by BSI 4550:Part 5:1972.
leachability of heavy metals decreases being locked in the mass of brick. 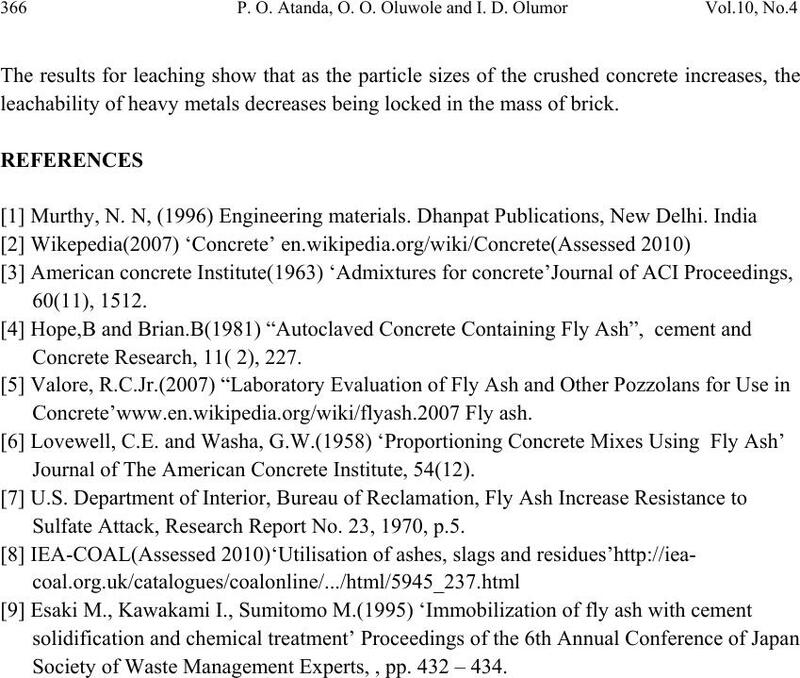 Concrete Research, 11( 2), 227. 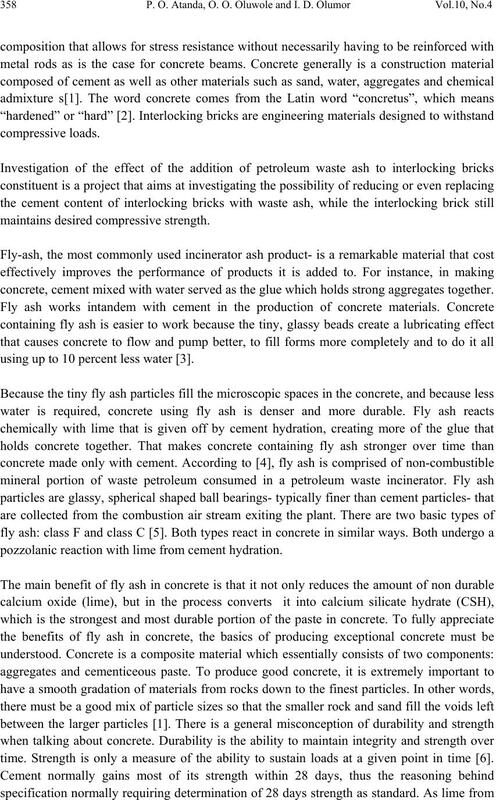 Journal of The American Concrete Institute, 54(12). Sulfate Attack, Research Report No. 23, 1970, p.5. Society of Waste Management Experts, , pp. 432 – 434.